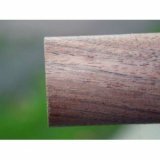 Our Walnut Dowel Rods are made of American Black Walnut which is of medium density and works easily with hand and machine tools and stains and paints well. Our Walnut dowels are used in fine furniture, cabinetry and architectural mill work. All our Walnut dowels are produced from lumber that has been steamed for a uniform dark appearance. Walnut Dowel Rods are available in lengths of 36" and diameters from 1/4" to 1-1/8". Click for Pricing" for volume price discounts and to place your order. Call for info on other lengths and diameters.